The varnished, wooden boat with curtained windows pulls up to the dock, and the handsome driver offers me his hand as I step into the boat. “Buon giorno, Signora,” he says, “Please...” and he gestures toward the boat’s empty seats. Sitting in the back with the wind blowing through my hair, I feel like a starlet being whisked away to my secluded Venetian hideaway as the sun sets behind Santa Maria della Salute. That’s exactly the feel those boats emblazoned with “Hotel Cipriani” in crisp, white lettering on the side are supposed the conjure. Hotel Cipriani, set across the canal from San Marco on Guidecca, is just a boat ride away from the heart of Venice, but its soul is in the glamour of a bygone era. In 1931 a young Italian barkeep named Giuseppe Cipriani opened Harry’s Bar, an establishment which drew the glittery aristocrats for whom Venice was a playground. Harry’s Bar, named for Cipriani’s English benefactor, thrived and became the storied second home to the likes of Hemingway, Noel Coward, Charlie Chaplin, Arturo Toscanini, and Orson Welles. Along the way Cipriani invented the Bellini, Venice’s fabled champagne cocktail (made with prosecco, of course). The bar reopened after World War II, and in the 1950’s tourists began to return to Italy, helped in part by Hollywood’s cinematic romance in movies like “Roman Holiday,” “Three Coins in the Fountain,” and “Summertime.” Having reestablished Harry’s Bar, Cipriani sought to create another iconic Venetian destination. He purchased land on Guidecca, just across the canal from San Marco, and built a gorgeous playground for the sparkly set: Hotel Cipriani. Painters have been drawn to Venice for centuries because of the city’s extraordinary quality of light. 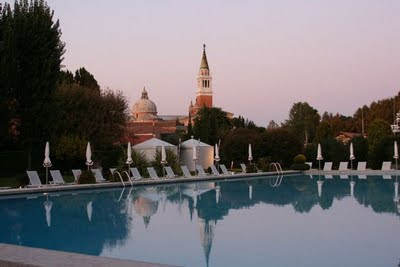 Bathed in soft Venetian twilight, the Hotel Cipriani feels a bit like a movie set. Over the last two years the hotel has had a major facelift, with the renovations leaving it looking youthful and luminous once again. Indeed, light is as important at the Cipriani as luxury. The fabrics, paints, colors and textures are all designed to flatter its occupants, painting the hotel’s guests in soft, glowing light cast by silk Fortuny fixtures. But the beauty of the Cipriani isn’t theatrical slight of hand. The hotel’s location on one of the lagoon’s outer islands feels removed. Absent are the throngs of day-trippers and cruise ship passengers who fill San Marco and the Rialto from mid-morning to dusk. However removed its guests may feel, they can never forget they are in Venice. From the custom-designed Murano lamps to the fabrics created exclusively for the hotel by Rubelli, every tasteful note is filled with the luminosity of Venice. The hallways are lined with watercolors of Venice’s landmarks, each commissioned for the hotel and reproduced on rich, creamy paper for the hotel’s postcards and stationery. Over the writing desk in our room, we had a view of San Giorgio Maggiore -- not out the window, but in an original oil painting. Even our WC featured an old print of Copernicus’ heliocentric universe, framed in a gorgeous antique, Murano glass frame. According to Laura di Bert, the Cipriani’s PR Manager, everything from the parquet floors to the plastered walls to the exquisite furnishings were made in Venice and reflect traditional Venetian craftsmanship -- part of the Cipriani’s quest to remake the landmark into a reflection of its heritage. The Shower: fabulous! The white Carrara marble enclosure was huge with great water pressure, and I had a delicious bath in the soaking tub complete with bath salts. The Green Report: during the Cipriani’s renovation, the hotel used locally-made and sourced goods across the property. This cut down on greenhouse gasses from the shipping and transportation in addition to helping the local economy. 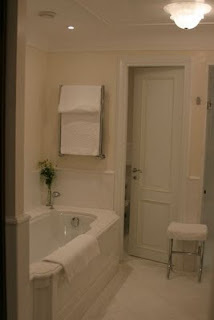 According to the hotel staff, the only item not from the Veneto region was the marble for the bathrooms which came from Carrara, Italy. Children Welcome: until two years ago the answer was “no.” But the Cipriani’s new management has begun to change that. They now offer a children’s menu and Venice-related outings just for children including fishing and tennis lessons. 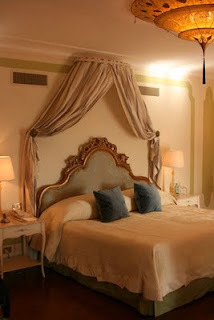 The Cipriani is still a romantic hotel geared toward adults, however. Breakfast: a gorgeous buffet including fruit, yogurt, cereals, and pastries is included and can be delivered to the room at no charge. Price: very expensive. The Cipriani is an elegant splurge -- just the place for a honeymoon or other special occasion. If you can’t afford to stay there, you can certainly enjoy the hotel’s signature drink, the Bellini, either in the hotel bar or at Harry’s Bar, not far from San Marco. Notes: the Hotel Cipriani closes for the winter season (generally November - April 1). 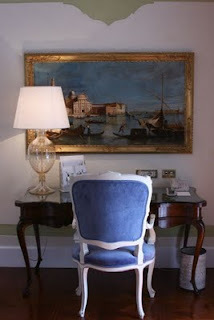 The Cipriani is one of the luxurious hotels in Venice featured in the Kiwi Collection. The Cipriani staff is attentive without hovering and very gracious. Before our arrival my husband called the hotel to let them know that we would be arriving early. I had a terrible case of the stomach flu and was not up for an afternoon of sightseeing. I expected to spend some time out by the gorgeous pool or in one of the lounges until our room was ready, but when we arrived by boat half-an-hour later, our room was ready for us hours before check-in on a day when the hotel was completely full. Our stay at the Hotel Cipriani was a second honeymoon -- a decade into our marriage. The Cipriani is a romantic enclave in one of the most romantic cities in the world. Our room was filled with fresh flowers. We had breakfast delivered one morning and prosecco chilled on ice in the evening. And aside from the people we saw in the hotel’s bar and restaurant, the entire hotel might as well have been our own. When I was ready to venture back out on the water and into Venice, my boat was waiting for me at the dock. I took my favorite seat at the back of the boat, and we slipped across the lagoon, bathed in the liquid gold light of afternoon. As the Cipriani disappeared behind us and San Marco grew larger ahead, Erica Jong’s description of Venice came to mind. “It is the city of mirrors, the city of mirages,” she wrote, “at once solid and liquid, at once air and stone.” The Hotel Cipriani captures Venice’s elusive nature while romancing the starlet within. 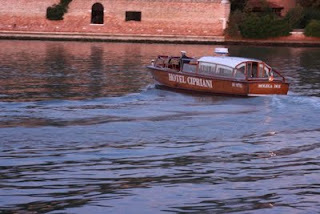 The Hotel Cipriani has a fleet of elegant little boats to shuttle their guests, free of charge, to and from the hotel. The hotel’s boat dock is, appropriately enough, just down from Harry’s Bar and only steps from San Marco. At the dock there’s a telephone with a direct line to the hotel. Just call and a boat will come straight away to whisk you across the canal. 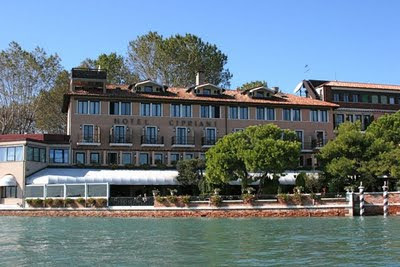 The hotel may be removed from the main action in Venice, but it is by no means remote. On the island of Guidecca sits Santissimo Redentore and just across the Canale delle Grazie is San Giorgio Maggiore. Both churches were designed by Palladio, one of Venice’s greatest architects, and are masterpieces of Renaissance architecture. I highly recommend a trip to the top of the campanile at San Giorgio Maggiore. There’s never a line for the elevator, and the view is spectacular. Note: my stay at Hotel Cipriani was sponsored by Hotel Cipriani and KiwiCollection.com. Read more about my review policies. Really nice write up! I got a great sense of the place and your photos, especially from the pool, brought it together. Thanks for sharing! You don't know how much I love posts like this! It sounds positively sybaritic and I feel like I was right there with you (minus the stomach bug of course). I am now plotting how I can possibly get there with my husband and no children. Perhaps I could find some nice Mamma up the canal to watch them for a couple of days? VERY COOL. i'd love to go there. i know that venice isn't handicap accessible - was it the same way here, at this hotel? cool that they now have kids activities. great photos! JessieV: Interestingly, while I was in Venice there were some visible signs of accessiblility -- a few ramps over key bridges, etc. It was a topic of conversation, too. The ramps were there are part of Bienniale and an accessible Venice push. I talked with several people there about it, and there is a movement afoot. We'll see how that goes. As for accessibility at the Cipriani: our room was accessible (minus grab bars in the toilet), and the hotel has an elevator. In fact, the entire first floor is on one level, so it would be a good choice for those who need stair-less accommodations. I wouldn't say it is as accessible as a new hotel in the US, but for a historic property in Italy, it is pretty darn easy to navigate. Where do I read more about your review policies? Or you can find it under "Advertising" in the header bar at the top of my blog.